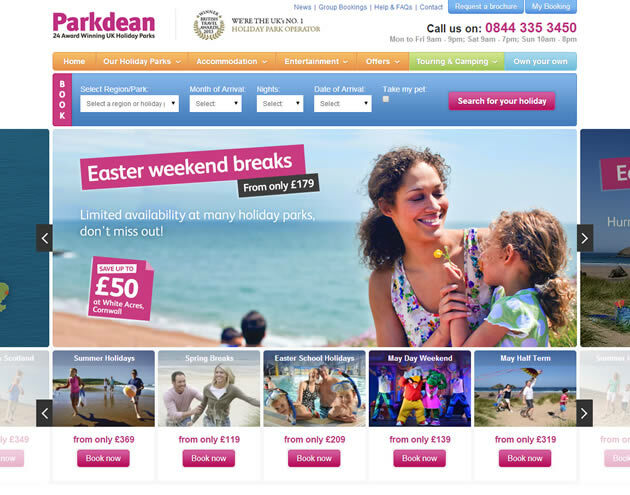 Back in February, we told you about the new responsive web design project that we had worked on with Parkdean Holidays. The aim of the project was first and foremost to reduce the bounce rate of the homepage. Many non-responsive websites have been seeing their bounce rates increasing, due to the rise of non-desktop device usage. Users who visit a static website on a smaller screen, must rely on pinching and zooming to consume content and move around the website. This tends to lead to higher bounce rates, and therefore poorer conversion rates. It has been approximately one month since the new responsive homepage was launched, and we have been monitoring performance with the Parkdean team. So far performance has been great, with a sharp reduction in bounce rate and users on smaller screens engaging with the website more than the previous version of the homepage. We are currently working on a number of responsive projects for Parkdean, due to the success of the new homepage. This project is the latest in a number of responsive website projects that we have launched recently. Take a look at our work to find out more.